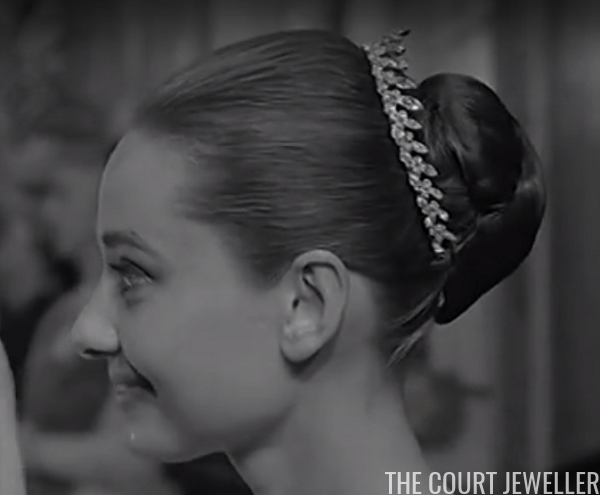 On Wednesday, Christie's in London sold a personal collection of objects that belonged to the late Audrey Hepburn, including several pieces of jewelry -- and a tiara! The tiara is a costume piece. The lot notes from the auction describe it as "a colourless paste tiara ... composed of a continuous series of graduated navette and circular shaped paste, to close-back settings on a sprung frame." Audrey wore the tiara at least twice. Above, she dons the tiara at the London premiere of A Nun's Story in the summer of 1959. She attended the event with her then-husband, Mel Ferrar. She also wore the tiara on screen. Above, you can see her wearing the piece as Joanna Wallace in 1967's Two for the Road. The tiara looks smaller here, because the ends are tucked into her '60s hairdo. 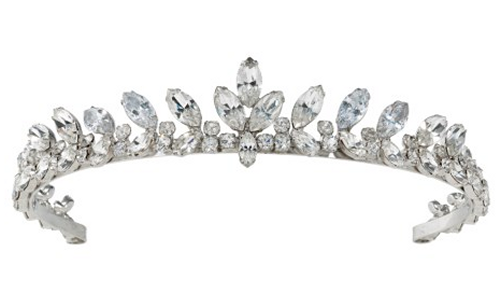 The auction estimate for the tiara was set at £7,000 to £10,000. When the hammer fell, however, the tiara had fetched £43,750 (a price that includes the buyer's premium). Not bad for a celebrity tiara that sparkles without a single diamond!